If you're looking for a steady job with good pay, medicine and law have always seemed like safe bets: You spend a lot of time in the library and a bunch of money on loans, but as long as people are getting sick or sued you've got work, and you get paid a lot to do it. When you consider, however, that the average In-N-Out manager makes more than $160,000 a year, memorizing the names of bones and obscure legal battles starts to sound silly. 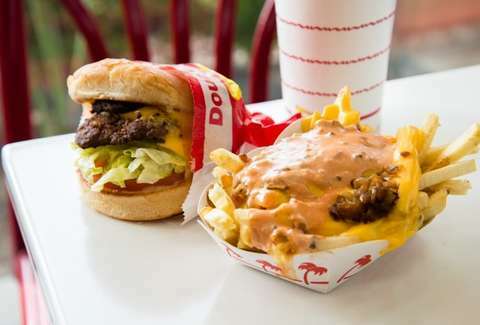 In-N-Out revealed the new salary details in an interview with the California Sun, which also pointed out that it's triple the fast-food industry average. In fact, $160,000 a year is more than the average salary of both architects ($76,930) and pharmacists ($122,230), according to data from US News & World Report, as well as similar data from sites like Indeed and Glassdoor. You don't even need an undergraduate degree, let alone capital letters next to your name. As for what you'll be doing, an In-N-Out manager oversees all aspects of a single restaurant location. "These responsibilities include ensuring that quality, service, and cleanliness meet our high standards," In-N-Out told KTVU. "As leaders, they hire, train, and develop their team, and are responsible for creating and maintaining an enthusiastic and positive working environment." In-N-Out also ranked higher than Google in a Glassdoor ranking that said the cult burger chain is the fourth best place to work in 2018. Per that same ranking, 92% of workers would recommend the company to a friend. A starting worker at In-N-Out earns $13 per hour, which is $2.50 above California's minimum wage. From there, an employee can work up to that manager position and the salary that comes with it. You'll also get health insurance, vision, 401K, and dental plans, plus paid vacation. We're not telling you to drop out of law school and move to California. But we're not telling you not to drop out of law school and move to California. James Chrisman is a News Writer at Thrillist who is offensively wealthy. Send news tips to news@thrillist.com and follow him on Twitter @james_chrisman2.